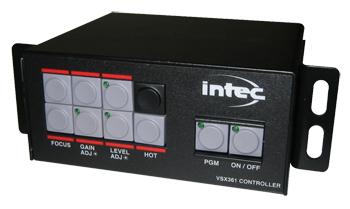 Integrated Camera Controller for INTEC VSC500 Series high performance environmental cameras. 9 - 36 VDC Wide Input Voltage suitable for uneven vehicle electrical systems. Superior Shock and Vibration Resistance withstands industrial and off -road applications. Compatible with all INTEC VSM Series Monitors. Universal Mounting Brackets for ease of installation in a variety of applications. Optional Flush Mount Kit for in dash or in console installations.